Bromance between leaders of world’s largest democracies blooms in White House Rose Garden. WASHINGTON, DC: Amidst serious talks on terror and trade, the maiden meeting between President Donald Trump and Indian Prime Minister Narendra Modi was sprinkled with a generous dose of bear hugs and handshakes, and marked by a staunch determination to be true friends and partners. 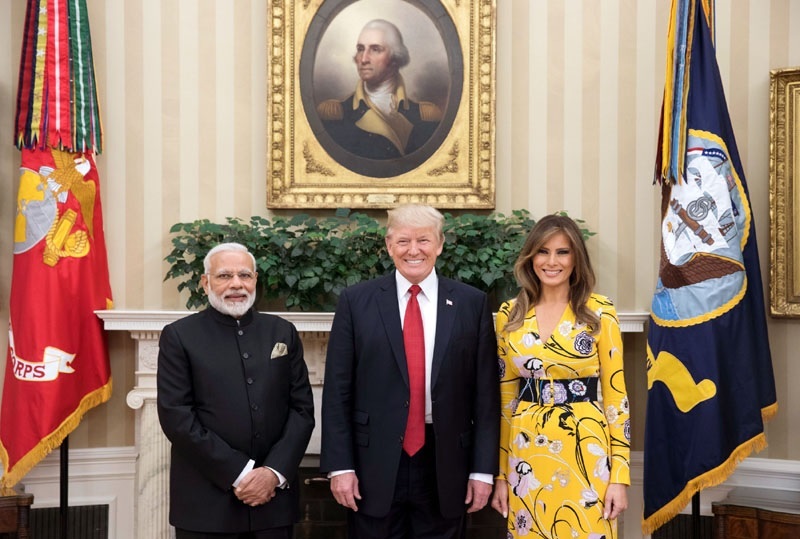 “The future of our partnership has never looked brighter,” the president said at a joint news conference with Prime Minister Modi in the Rose Garden of the White House. “India and the United States will always be tied together in friendship and respect,” he pledged. “The security partnership between the United States and India is incredibly important,” said President Trump, noting that both India and the US “have been struck by the evils of terrorism and we are both determined to destroy terrorist organizations and the radical ideology that drives them. We will destroy radical Islamic terrorism,” he underscored. “The top priority for both President Trump and myself is to protect our society from global challenges like terrorism, extremism, radicalization,” Modi said in his joint statement. In a big win for India, the US designated the Hizb-ul-Mujahideen leader Sayeed Salahudeen based in Pakistan as a “global terrorist.” He heads the main rebel group fighting for autonomy in the Indian state of Jammu and Kashmir. To further the bilateral economic partnership, Modi invited First Daughter Ivanka Trump to lead the US delegation to the Global Entrepreneurship Summit in India this Fall, and she accepted. President Trump called for “a trade relationship that is fair and reciprocal. It is important that barriers be removed to the export of US goods into your markets, and that we reduce our trade deficit with your country,” he said, in the joint statement. At the time of filing this story, it was unclear if the contentious issue of work visas or the Paris climate accord favored by India figured in the bilateral talks. “President Trump’s executive order on H-1B visas directs the Secretary of State, the Attorney General, the Secretary of Labor, and Secretary of Homeland Security to propose potential reform to the H-1B visa program. However, there have been no immediate changes to issuing these visas, no changes that target any specific country or sector,” the official said. At the press meet in the Rose Garden, Trump praised the prime minister noting with admiration that Modi will soon begin to implement the largest tax overhaul in India’s history, and extolled his big vision for improving infrastructure and fighting government corruption. President Trump’s penchant for social media is well known, a trait he shares with Prime Minister Modi. They are the world’s two most followed political leaders on Twitter: the US president has about 32.7 million followers while some 30.9 million users follow the Indian leader. Calling India a “very, very incredible nation,” he stated, “I have always had a deep admiration for your country and for its people, and a profound appreciation for your rich culture, heritage and traditions”. “After our meetings today, I will say that the relationship between India and the United States has never been stronger, has never been better,” he said. Modi believed the bilateral talks were important because they are based on mutual trust and revealed a convergence and similarities in values and priorities. “Be assured that in this joint journey of our two nations towards development, growth and prosperity, I will remain a driven, determined and decisive partner,” he said, in the joint statement.